August 22, 2010 - There’s a deeper story behind the unfortunate Steven Slater JetBlue incident in which the flight attendant who cursed over the airplane's public address system, grabbed a beer and then exited JetBlue’s Flight 1052 via the aircraft's emergency chute. There has been a tremendous change in the airline industry which has impacted airline employees over the last decade. Air travel isn't what it used to be and 9/11 fundamentally altered the way we fly. What many in the public don't realize is the job of a flight attendant has changed drastically since the glamour days of the 1970’s. The security and safety of passengers is still the No. 1 priority, but with airlines continuing to cut back on amenities no food, charges for checked bags, smaller seats and cramped passengers. Flight attendants must now deal with more stressed and frustrated passengers. Furthermore, flight attendants have seen their pay slashed over the last decade. Most flight attendants are working more hours for less just to make ends meet. And some of those hours are unpaid because flight attendants are only paid when the aircraft door is closed and pushed from the gate. Flight attendants are not paid during boarding and deplaning, or during most delays. Flight attendants can be on the job for 15 consecutive hours and then receive only an 8.5-hour rest period during which time they must travel to and from the airport and hotel, and find something to eat. When all is said and done, actual rest time is reduced to well under 8 hours. This rise in frustration and aggravation onboard flights among flight attendants and passengers is not being felt in the airline executive suites. Customers are being nickel and dimed for everything as airline executives continue to reward themselves with multi-million dollar bonuses. What this boils down to is the airline industry needs to change. There are array of responsibilities and issues that flight attendants deal with everyday on the job in their demanding profession that most of the public has no knowledge of. 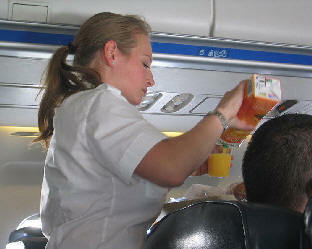 From the obvious flight attendants also are required to remain on duty for as much as 18 hours in a single day, away from their homes up to 18 nights a month, responsible for the safety of hundreds of people at any given time, must an employee pass an annual safety test in order to remain employed, deal with more than 8,000 customers every month. This by no means is an excuse for the behavior of Steven Slater. However, with some understanding of the roles and responsibilities of flight attendants the traveling public can have a better perspective and appreciation for the work fight attendants do.